Today, we're happy to announce that we're increasing everyone's free storage in Gmail from 7.5 GB to 10 GB (and counting) to celebrate today's launch of Google Drive. The increase will take effect over the next 24 hours. We hope you all enjoy the little bump! One day I was looking at how many messages I have in my sent mail, and realized there are a lot of things I wanted to know about my email habits. 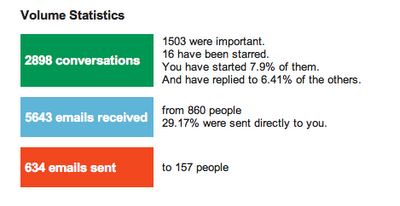 How much of my emails do I read, and do I reply fast enough? As luck would have it, Romain Vialard, a Google Apps Script Top Contributor, developed a tool called Gmail Meter powered by Google Apps Script. 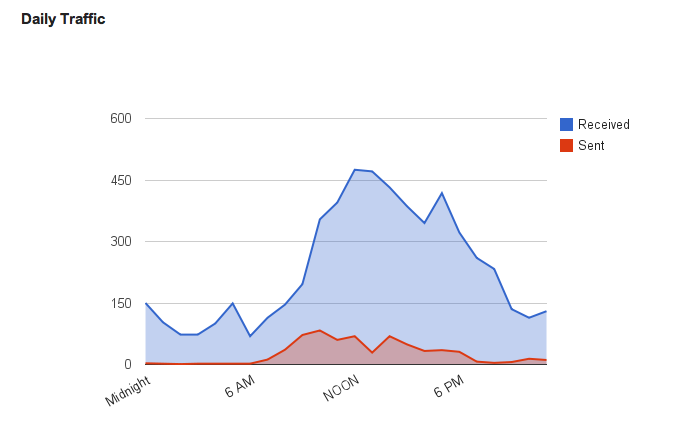 Gmail Meter is an Apps Script which runs on the first day of every month and sends you an email containing different statistics about your Inbox. In a similar way to how recently introduced Google Account Activity gives key stats about how you’ve used your Google Account, Gmail Meter gives you different types of statistics that will help you analyze your Gmail habits. Volume Statistics show you the number of important and starred messages, the number of people who sent you emails, and more. Volume statistics can be very useful in determining how you are using email efficiency tools like Priority Inbox. 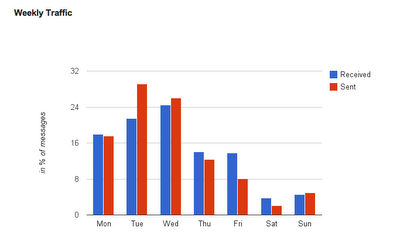 Daily Traffic gives you an estimate of when you receive messages and when you send them during a given month. For example, in the graph below you can see how the peaks in my “Sent” curve indicates that I write emails in spurts. Traffic Pattern lets you get a sense of your overall email activity over the past week. Email Categories tells you how you are managing your Inbox. 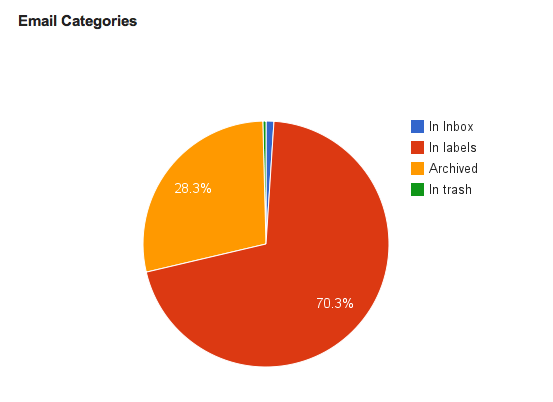 In the pie chart below, you can see that the majority of my emails are labeled. My Inbox is tiny compared to other labels which indicates that I keep a lean and mean Inbox. 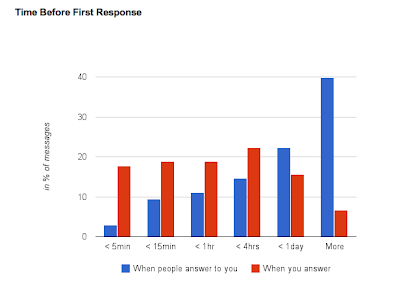 Time Before First Response shows you how long it takes you to reply, and how long it takes others to reply to you. By looking at this chart, I can infer that I reply faster than others I communicate with. 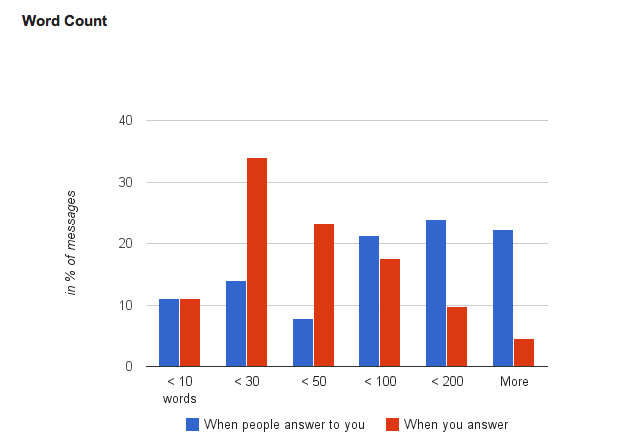 Word Count tells you whether you are writing long emails. The example below shows that most of my emails are shorter than 200 words. Thread Lengths help you understand whether you participate in long conversations resulting in long threads. Top Senders and Top Recipients help you identify who you communicate with more frequently. It is easy to set up Gmail Meter. First, go to Google Docs and open a Spreadsheet. Click on Tools > Script Gallery. Search for “Gmail Meter” and click Install. You will now see a new menu item called Gmail Meter on your spreadsheet. Click on Gmail Meter > Get a Report. You can then choose the type of report. Preparing a report may take some time and you will get an email once the report is ready. If you would like to know more about how this script works, be sure to check this tutorial. Learning about my email habits has helped me become more email efficient. So, before you read that next article on "Writing Effective Emails," be sure to learn more about your own email habits using Gmail Meter. Update 4/26/12: To clear up some confusion, Gmail Meter is not developed by Google. Although we're highlighting it here, as with any third-party scripts, we can't guarantee security. 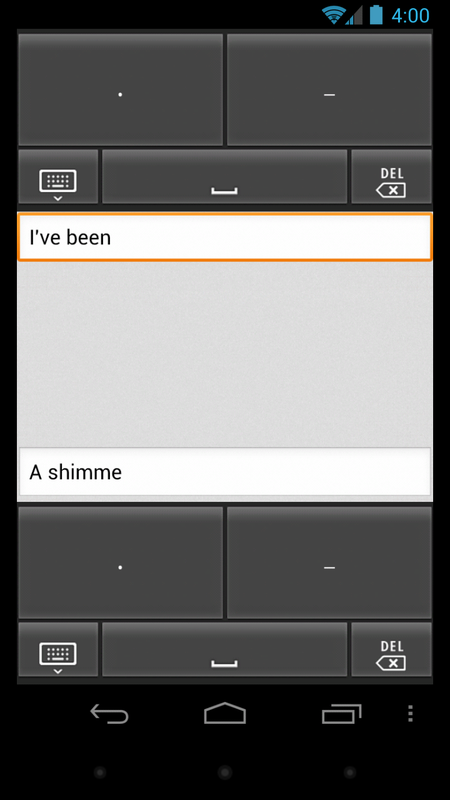 Gmail Tap takes the keyboard from 26 keys to just two. Every letter of the alphabet is represented by a simple pattern of dots and dashes, and once you know them you can type without even looking at your screen. 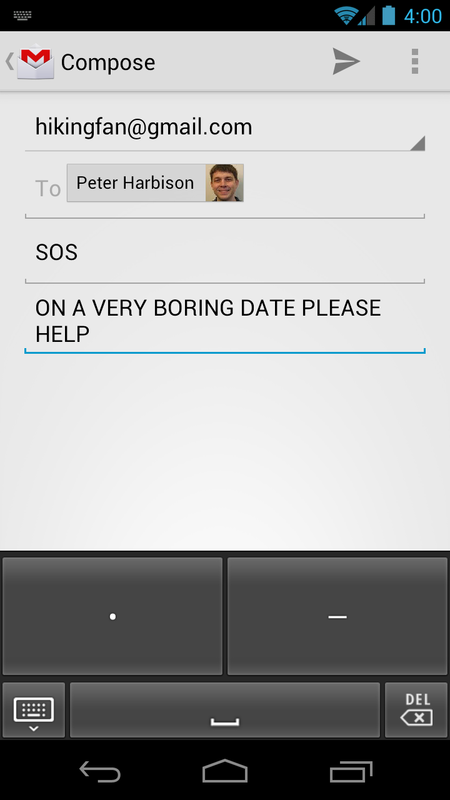 This makes it ideal for situations where you need to discreetly send emails, such as when you're on a date or in a meeting with your boss. To get started with Gmail Tap, head over to our informational page and watch our video. Then let us know what you think on Google+.